But as a blocked writer who stares at a blank page, where do you start? How do you begin to build your social media content from scratch? You need some ideas. Try having a brainstorm session to create a plan with an end goal in mind. Your end goal will come from your Content Marketing Strategy. If you are feeling overwhelmed, don’t worry. Sprout Social is here to help you figure it out. Now that you have your goals, you are ready to create content for your social media profiles. Ask a question, create some choices and allow your audience to vote. Facebook and Twitter make creating polls an integrated process. Polls are engaging and fun for your audience. And they can also provide you with valuable information about your followers. 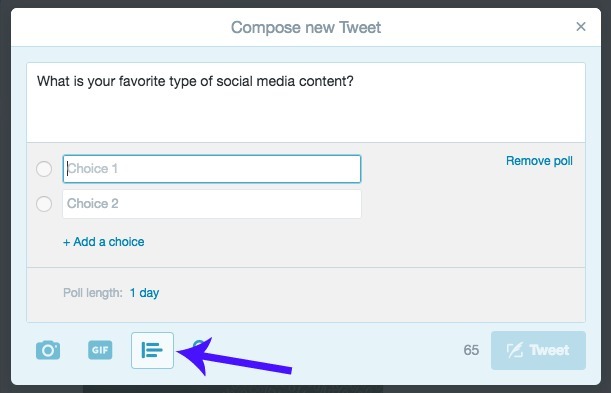 On Twitter, you can create polls directly from the compose new tweet box. For Facebook, visit apps.facebook.com/my-polls/ to create a poll for your audience. Infographics are a wonderful way to share facts and statistics with your followers. There are a few resources to help you get started. You can visit Daily Infographic to get ideas of all the topics you can share in an infographic. To create your own, try Visual.ly or Canva. Canva allows you to create a custom size or choose from a variety of templates. 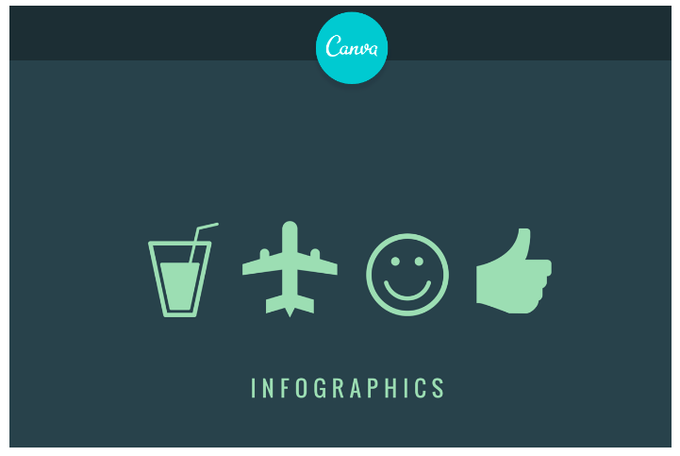 The blog graphic template tends to be a good size for an infographic–800px by 1200px. Kris Carr used this method recently for her audience. She added an appropriate photo and received 518 reactions in the first 16 hours. This is great for generating comments because viewers want to share their answers. Followers will engage with you and others starting an ongoing conversation. 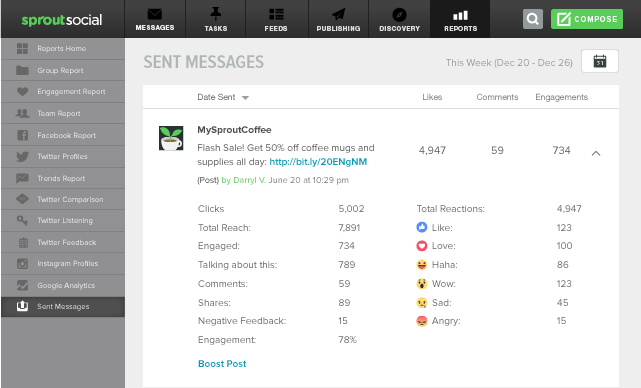 You can even keep track of how your audience is engaging with your fill-in-the-blank posts using Sprout’s sent message report. You’ll be able to analyze Facebook Reactions for each post. You social media content is not about putting something up just to have it there. You want engagement and questions are a great way to get it. Keep your questions short. Either-or questions are easy for followers to answer. Everyone loves to full inclusive and your brand can take advantage of that feeling. try to post social media content exclusive to each network. This makes it valuable to follow all of your social media handles. Whether you want to go live or pre-record, videos are a great way to engage your audience and give yourself a break from writing. You could give an office tour, demonstrate how a product is used or present some tips. You could also provide a video response to customers’ questions on your pages. Jay Baer took to video to introduce a new member of the Convince and Convert team. People adore quote graphics. This is great news for you because they are so easy to create and share. You can use Canva to choose the right template for the network where you’re publishing. Add a great photo and overlay the quote text. You can also experiment with Sprout’s built-in social image editor. While these are all great types of social media content to share, this is not an exhaustive list. Look for inspiration from other businesses in your field and come up with your own. Now that you have a good idea of different post types, you want to develop a system of inspiration so you always have content to share. There are a number of ways you can do this. You could create a swipe file for yourself using a service like Pocket or Evernote. These platforms allow you to capture articles and content ideas as you browse the internet. You can go back to these captures later when you need a refresh on ideas. You could also create a Twitter list of top social media content creators to keep up with regularly. See what they create and evaluate what gets the most social media engagement. Then adjust it to match your own audience, products and services. What if you don’t have to start from scratch? When building out your social media content, you don’t necessarily have to start from scratch. You can share content from others that goes along with your niche. While you always want to have some original content out there, becoming a master curator of other people’s content is valuable too. Curating content shows that you are a team player and like to support others. This allows you to build a community and others will often reciprocate and share your content. This is one of the fastest and most authentic ways to build great business relationships. Questions like the one above are great because they allow you to get to know your audience better while demonstrating your knowledge. It is a subtle way to share knowledge. Then follow up with a post on some of your audience’s answers and the statistics you found. You can create a game out of repurposing content. Have yourself and your team see how much mileage you can get out of each piece of content you create. What new graphics can you create out of it? What pieces can you combine to form new posts? Record an audio version of information you have already gathered for those who would rather listen than read. Content can be broken down into smaller sections, pieced together to create larger projects and reworked into something entirely new. Have fun with it. Another tip for creating massive amounts of social media content from scratch is to batch it. Social content creation is like meal prepping–do it at the beginning of the week and you are done. 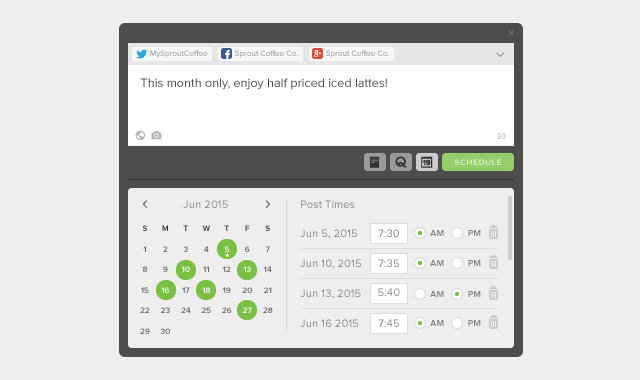 Also, you can pick a time at the beginning of the month to create your social media content and schedule your posts. Get every bit of use you can out of each piece by repurposing and create the month’s batch all at once. You could break up these content batching times by network-focusing on Facebook, Twitter or LinkedIn. Or you can do this by content type. You will save a ton of time later on if you get in the flow of creation. To use the meal prepping example, you will want to gather all your ingredients. The tools and/or team members that you need to create graphics and write posts. Then get to work. Social content creation is like meal prepping–do it at the beginning of the week and you are done. Has this post given you some great ideas to get started with your social media content creation or to take it to the next level? Once you have your content created and shared, you will want to start measuring and evaluating. Different audiences-on different platforms-will react differently to content types. Mix it up and test to see what social posts you get the best response and engagement from. Become strategic with how and when you share. Social media is an ever-changing field. You must learn to go and grow with it.